This letter is in response to your inquiry on October 5th, 2007, regarding the regulatory capital treatment of the liquidity facilities to be provided to a structured finance vehicle, the Master Liquidity Enhancement Conduit. As the Final Statement recognizes, structured finance transactions encompass a broad array of products with varying levels of complexity. Most structured finance transactions, such as standard public mortgage-backed securities and hedging-type transactions involving “plain vanilla” derivatives or collateralized debt obligations, are familiar to participants in the financial markets, have well-established track records, and typically would not be considered CSFTs for purposes of the Final Statement. This was released at the beginning of 2007. We have seen just how plain vanilla and understandable CDOs really are, haven't we? No need for any special procedures involving risk evaluations on those, right? Under the loan funding facility, a participating liquidity bank would make a 364 day commitment to lend to M-LEC. If M-LEC draws on the facility, the liquidity bank would be obliged to extend a term loan to M-LEC. The loan would rank pari passu with the ABCP and MTNs issued by M-LEC and would be backed by M-LEC's assets. If, at the end of 364 days, the liquidity bank chooses not to renew its commitment, M-LEC would have the option to draw on the loan commitment, resulting in a term loan to M-LEC with a maturity, for example, of three years. Under the Capital Guidelines, the credit conversion factor for an eligible ABCP liquidity facility is based on whether the facility has an original maturity of one year or less. Under the Capital Guidelines and the Board's interpretation thereof, original maturity is the length of time between the date the commitment is issued and the date the commitment terminates or the earliest date on which 1) the Bank can, at its option, unconditionally (without cause) cancel the commitment and 2) the Bank is scheduled to (and as a normal practice, actually does) review the facility to determine whether or not it should be extended. Each liquidity facility you describe has an original maturity of 364 days, with an option that allows M-LEC to draw upon the facility and receive funding with a maturity of up to three years should the Bank providing the facility decide not to renew it. Under the Capital Guidelines and the Board's longstanding interpretations thereof, the term of any advances that can be made under a commitment is not taken into account in determining the commitment's original maturity. Thus, the M-LEC liquidity facilities would have an original maturity of one year or less for risk-based capital purposes. Therefore, the credit conversion factor that would apply to the notational amount of the M-LEC liquidity facilities would be 10 percent. It's all plain vanilla and there is no need to get all chocolate about it and invent complications. To meet the sudden demand, the institutions sold $143 billion of short-term debt in August and September, according to the FHLBs' Office of Finance. The sales pushed outstanding debt up 21 percent to a record $1.15 trillion, an amount that may become a burden to U.S. taxpayers because almost half comes due before 2009. Federal Home Loan Bank obligations, when combined with the $1.5 trillion debt and $4.7 trillion in bond guarantees of Washington-based Fannie Mae and Freddie Mac in McLean, Virginia, are 46 percent more than the $5.04 trillion of Treasury debt held by the public. The concern here is that as the AAA rated collateral gets cut, some of the institutions who have borrowed will find themselves in a bind. I believe the current ABX swings are overstatements of eventual losses, but if I am wrong, there is a potential squeeze on the members of the Federal Home Loan system. Because the spreads in the commercial paper market have stabilized, most of the institutions that were borrowing will be less likely to do so, but my guess is that the most-impacted will continue. It makes me wonder. The converse to this risk is that having the FHLB system does work to prevent shocks from becoming downward spirals for the entire system. The 3-5 month worry is that A2/P2 nonfinancial debt. Hey, if you want economic news, go over to Calculated Risk. Just the name should tell you that they're done with their calculations, and I'll be working on mine for some time to come. But because I love you, and it's Friday, and some things should concern us all deeply, I bring you this breaking news snippet from the great state of Pennsylvania, sometimes laughingly known as Pennsyltucky. The Department of State made its decision as a result of terrorist bombings that occurred just days before Spain’s national elections in 2004, spokeswoman Leslie Amoros said. Election officials consulted with state police, the Pennsylvania Emergency Management Agency and the state Office of Homeland Security. “The agencies agreed it was appropriate not to release the statewide list to protect the public and the integrity of the voting process,” Amoros said. Registered voters can find polling place information on the state’s voter services Web site or by calling the state or their county elections bureau if they lack Internet access, Amoros said. I see. My guess is that all the government workplaces would also distribute their own lists as well to those employees. So not-permanently-absent public-payroll voters would get information about where to vote. Determined ex-public-payroll voters willing to do a little research would also be able to find their polling places. It would be rather hard to do an ID check over the phone or the internet, so I guess the theory is that a terrorist organization would be dissuaded from operations by this supremely secure barrier. Sure, wannabe terrorists would be willing to risk life terms and/or suicide for their cause, plus go through the hassle of smuggling explosives, building a bomb, all that jazz ... but no way would they actually go through all the work of looking up polling places on the internet or calling anyone. 'Cause that would be hard right? And we all know that splodey dopes won't work hard, right? No, shoot, if they can't get a list of polling places they'll just wander off to spend the evening in a pizza parlor, bemoaning their hard luck, right? Or maybe a strip joint, or a little gambling. Whatever. Just so they don't happen to drive past a polling place, see the lines of voters and decide to decimate them. Because splodey dopes are well known to be blind as well as having the attention spans of hyperactive kittens thrown into a bathtub. You know what I think? I think the terrorism the PA admin is worried about is this here growing Pennsyltucky anti-incumbent terrorism. It's a problem. No matter what the hapless legislators have done to prevent it, like holding votes to vote themselves pay raises in the middle of the night, those sneaky, pesky voters keep finding out about it and punishing them by voting them out of office! Now that's terror! And what could more disrupt the "integrity of the voting process" than having incumbents voted out of office for such perfectly rational decisions in the public benefit? In the last election the losses were terrible - about 1 out of 5 state legislators got the axe. The casualties! Not only did those voters act in a revolting and terrifying way in the last state elections, but they're preparing to do it again to the next batch! That must be stopped in order to "protect the integrity of the voting process". One thing state and federal legislators agree on - a voting process with integrity should function to get incumbents reelected every time, regardless of any petty, trivial discrepancies between what they promised during campaigns and what they did after being elected. Now you may be thinking, "Hey, M_O_M, whaddya care? You aren't going to be voting in PA."
1) The federal courts have some nerve ruling that requiring even free government-issued ID to vote in GA is somehow undue restraint whereas hiding the list of polling places in others is not. 2) If this plan succeeds in PA, voters in other states will find that voter security has abruptly become a pressing concern there as well. In GA, we have already been through the GA version of the SuperDuperSecretVoterSecurity plan, and I can tell you it was beautifully designed. It put PA's cruddy little venture to shame. First the legislature changed all the districts, and then they carefully avoided making any information available about the composition of those districts. It was quite difficult for even a very determined voter to find out what voting district he or she was now in. Basically, the only way that you knew where to go was if you were on the "good" list of your incumbent, and got the mail. A better incumbent-protection plan could not have been originated. Needless to say the voters' revolt in GA was epic, resulting in transfer of control from the Dems to the GOP. This was startling to say the least, because ever since Georgia voters got the right to vote back after Reconstruction, they had been voting for one party only. Georgia primary elections were the actual elections - the "final" was held for some bizarre federal reason no one could ever figure out and only a relative few participated dutifully in the meaningless ritual. 3) They will do so by whatever means possible, regardless of whether those means would otherwise seem somewhat radical. The latest crop of GA legislative delinquents seem somewhat cowed, so maybe we can let them lay for a while. Maybe. If they try to raise gas taxes, GA will promptly go Dem again. My theory about politicians is that they need to develop a healthy fear of the electorate. Last week, though, Bank of America revealed a bigger-than- expected 32 percent drop in third-quarter earnings, posting a loss of $717 million in trading and setting aside more than $2 billion to cover bad loans. ``I've had all the fun I can stand in investment banking,'' Chief Executive Officer Kenneth Lewis said. Ken, you are not alone. And it won't just be bonus- dependent bankers and Hedge Fund Guys that suffer as the crisis crawls to its endgame. The widows and orphans who entrusted their life savings with money-market funds might also find they have been unwitting participants in cutting-edge financial innovation. UI claims up a leg for the second week. It doesn't matter unless it lasts for a couple more weeks and has an impact on continuing claims, though - unless you are one of the people in those stats. I have a foreboding feeling about where these are going after reviewing the last quarterly changes in employment plus the projected annual adjustments, but if I don't write about it maybe it won't bleeeeeeep happen? Kind of a depressing durable goods advance report. I tried hard but really couldn't see much light in this one. Fabricated metal shipments and parts have dropped for several months, and YoY and monthly inventory is up. Transportation equipment YoY inventory is up, and monthly shipments and new orders are down. Computers and electronic products shipments and new orders are negative YoY and monthly. New orders for this category have been negative for two months. Monthly bleeping inventory is up for two months. I have the ugly feeling that this category reflects POS slowdown (that's Point-Of-Sale) which reflects weaker retail sales, which is the leading edge of the commercial retail bulding and mortgage problem. BLEEPETYBLEEEP! I may have to bleeping ban myself from bleeping writing on my own bleeping blog. Update: See CR for the scoop on New Home Sales. I could think of nothing to say about it but Holy Housing Crash, Batman! This one really met and exceeded all pessimistic expectations. Real completed new home inventory is now probably somewhere close to an astonishing 4-5 months' worth. Including in-construction, but excluding not-started, that would take us to around 8 months inventory if sales continued at 2007's pace. It seems doubtful that they will. Ballooning builder bankruptcies, Batman! And Still I Persist is back up with some really spectacular stuff. Try this post for starters. For those who aren't familiar with the territory, it can be hard to understand why the fires are so dangerous and hard to control. It's a combination of the terrain and the winds. The canyons and mountains form chimneys under certain conditions. This story in the San Diego Union Tribune of a family that was evacuated three times conveys how rough it has been in SD. The power situation is "highly dynamic". A decent roundup of the fires as of this morning. Harris is flaring up and Orange County is having some more difficulty. Winds are generally moving to an onshore pattern, but this could blow flames back over skipped areas in the interior, so the firefighters are still under extreme pressure. Prior posts with other links. Because of the generally benign effects of the previous rate cut on mortgage rates, the odds are now very high that this existing home sales report will cause the Fed to cut 25 bps and probably another 25 bps quite shortly. The one thing the Fed cannot do is cut rates if rates force higher mortgage rates, but the previous cut combined with the demand drop is forcing price competition for qualified borrowers and offsetting inflation worries. The Fed has room to cut again and it almost certainly will. Given the choice between baseline consumer inflation combined with a severe recession and baseline consumer inflation combined with a mild recession, the Fed will pick the second option. The major factor affecting mortgage rates is risk, and failing to cut increases risk enough to offset any marginal inflation-fighting effect. The significance of the report is as follows. The 2007 total actual sales will probably be between 5.6-5.7 million, down from 7.1 in 2005 and 6.5 in 2006. I am waiting for CR's post on the next NAR prediction, which should be absolutely delightfully funny. The actual YoY national sales drop was 22.7%, from 529,000 to 409,000. The pace of sales in 2008 depends on what the real economy does and should be in the 5.2-5.5 million range - provided that conditions do not change sharply for the worse. As for loss predictions, the bottom just dropped out. In every region, the average price dropped below the 2005 regional average. Median prices dropped below the 2005 median in every region but the Midwest. These comparisons are overweighted to the current prices because of the ubiquity of sellers concessions now versus buyers concessions in 2005, so the true number is worse. For example, in the West September's average was 347,300 versus the 2005 West average of 363,800. But the real current number is probably more on the order of $340,000. Current average 93.5% of the 2005 average. Play the funeral dirge of your choice. Industry apologists will explain that this was due to the suppression of higher-end sales due to higher jumbo mortgage rates. But this is untrue. 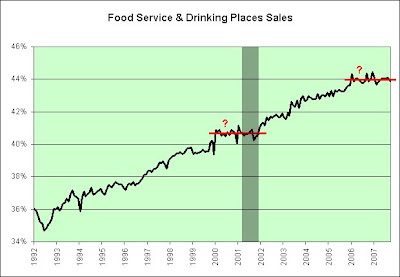 Actually, 2007 prices have been distorted up till now because of a shift in sales toward the higher end. This is never sustainable because you need the lower end purchaser to support the higher end, and the higher end homes will end up taking higher than average losses as they always do. In all too many areas, first time homebuyers who purchased from 2004 on are now underwater. Most who purchased in 2005 are underwater unless they put down at least 10%. It's a true blowout. Jingle mail is in the future, because although the hardest hit areas have fallen in price enough to bring more buyers into the market, buyers at a 30-35% discount are not going to help lienholders. Prices will continue to drop through next year and in some regions into 2009. We are going to roll back regionally to at least 2003 pricing. There was great debate and discussion about why Countrywide would refi its paying customers into FNMA/FHA loans. This is why. They get money back for operating capital while offloading their losses. I think FNMA is going to have to be very careful about its underwriting, though. Fannie's procedures for underwriting in declining price areas won't be much of a curb if Countrywide is doing the evaluations, will it? What is the incentive for Countrywide, or any other lender, to follow the guidelines if by ignoring them they are achieving their own survival? Hoo hah. I was going to post about casual dining, but frankly this report is inducing enough nausea to prevent discussions of it and restaurants on the same day. The downward plunge on the RE rollercoaster has begun. PS: The outlook for most European countries is slightly worse than ours. Catholicism may come back into vogue in Europe. "Hail Mary, full of grace ... pray for us now and in the hour of our layoff." The size of the writedown increased after Merrill conducted ``additional analysis'' of its holdings of so-called collateralized debt obligations, or CDOs, many linked to subprime home loans, O'Neal said in the statement. ``We expect market conditions for subprime mortgage-related assets to continue to be uncertain and we are working to resolve the remaining impact from our positions,'' he said. What really unnerves me is that they are still talking about subprime. There will be more overall losses in risk-layered Alt-A than subprime. Nonetheless, their analysis is likely to have recognized significant advance losses in CDOs, and this will cause everyone to turn a questioning eye on the other big players. It is likely that the details of Merrill Lynch's analysis escaped some other major players. In other international news, the most significant is that Australia's inflation is way up and their CB is expected to raise rates to compensate. The worries about Japan just do not diminish, and that's for good reasons. Canada is beginning to feel the effects of the strong loonie as higher retail prices are tending to push shoppers across the border into the USA. In recent days, European funds have been tending to invest more in US equities. On the face of it, this looks odd, because they are investing in a devalued currency that is likely to continue to devalue - but what of growth? In reality, the Eurozone has problems of its own relating to sustainable growth. France, of course, is in the middle of strikes and negotiations with its unions. But Germany has problems of its own in its internal economy. Real wages in Germany have been shifting down for some time, and transport strikes in Germany are just one symptom of that. The housing bubble in Europe, with the exception of a few countries, is somewhat worse than in the US. Ratios of household debt in the UK are actually higher than in the US, Ireland is seeing housing prices stagnate and fall, Spain is giving way, and the booming Italian infrastructure businesses are likely to take a hit from less building. The US probably still has one of the stronger consumption bases in the world. About thirty percent of the US population are financial conservatives, and as asset prices drop they will turn and step in. In a few CA markets, that was close to occurring already. The multinational corporations listed on US exchanges that can profit from global growth and can profit from currency fluctuations now look relatively better. Inflation has hit Europe too, and it isn't clear how strong the growth pattern there will really be. Paulson is headed to India. I have been watching Indian bank and financial strategies with some concern, because it looks to me like some of the big interests there are intent on getting into other currencies. This hints to me that inflation worries are rising. India's moves to increase reserve requirements may have caused banks there to worry about inflation-related currency swings and caused the movement to invest in other currencies as a reserve. Growth in India, a shortage of qualified workers and wage inflation have now reached the point at which India has started an outsourcing movement of its own, which is vital for continued world growth. In the US, fixed mortgage rates are now about where I calculate that they should be, provided the underwriting is pretty decent. Many of the larger banks are now beginning to really tighten mortgage underwriting by requiring higher downpayments for areas in declining markets, so we can all confidently expect at least a year more of credit-induced housing declines. That's on top of the demand/supply imbalance. One of the symptoms of the credit restructuring is that 1 year ARM rates are rising in the riskier areas to compensate for the higher expected defaults. They haven't moved to where they should be in every area, but they are getting there. The Chinese government is locked into an absolutely epic battle against speculation. It is trying everything, including forcing downpayment increases in areas with speculation booms (which produced an RE collapse in Shenzen), and in some regions, banning students from investing on the stock market. It is not clear whether they will win the battle, but if they don't, sooner or later there will be a collapse and a flight of capital. They have a lot to gain by continuing their struggle. On balance, I would say that the trend in international markets is shifting toward capital preservation. Such a change is likely to push capital into the Old Guard countries such as the Commonwealth countries, the European countries and the US. It is not a good sign for emerging markets under these circumstances. The problem with high growth in countries that have undemocratic systems is that it tends to pool money in a small percentage of the population who then shift to desiring safety of their own money more than growth. Thus high growth increases unfavorable trends for the general populations in such countries. Relative inflation of commodities combined with lower real wages produces a diverging trend of wealth distribution and causes capital to move into safety in other countries, short-circuiting internal growth, which then produces less external investment, which accentuates the trend and causes more capital flight. Worldwide commodity inflation trends cannot continue as is. Either this pattern will correct of itself or it will cause global political instability. If a few billion people cannot afford to buy food and fuel, we have a severe problem. The monks of Burma died because the people of Burma were aghast at the government passing through fuel costs, and the people were so upset because they literally need that money to buy food. We are so close to the conditions prevailing in the 1920s that it is frightening. The great probability is that a more flexible global investment system will allow a slow and painful correction. If it doesn't, the danger of war is great. What most political commenters miss is that the growth of radical Islamic movements in China (yes, in China) and the Islamic block is related more to high inflation and declining living standards for the average person on the ground than to any religious precepts. Yes, hatred of Israel and violent interpretations of the Koran serve as the nucleus for these trends, but any cultural nucleus at all would do. The same cultural processes are fueling hostility among the Chinese population toward Japan around the nucleus of Manchuria and WWII injuries. The peasant and urban workers of India, China, Indonesia and Burma are suffering extremely - and what worries me about Iran is less its nuclear weapons than the truly brutal measures it is undertaking to suppress its trade union movement. Update: The Rancho Bernardo list of burned homes is here (pdf). There's a short list up for Rancho Santa Fe. The SOSD blog has good information. CalFire still has good and complete news. Jim posted that the wind was down where he is, plus some other updates. A lot of sad stories around. Piggington's has quite a bit of good info posted, especially this about homeowner's claims. The Dawg's still barking. If you're real nice, he might put up a picture of a nekkid lady tomorrow in order to make the news easier to swallow. End Update. If you pray, pray. If you don't, consider trying it. It won't hurt you, and you don't have to believe to make a valid prayer. No one ever talks about the fact that the disaster test in NO before Katrina came up with 20,000 dead. We screwed up absolutely everything during Katrina, and less than 2,000 died. This is a major disaster. The Red Cross has an information page up. You can use their safe and well page to show where you are. The authorities are asking everyone to go light on cell phones so the emergency services have the access they need, and to stay off major highways unless it is an emergency (like evacuating). Seven counties now are involved with fires. Modesto Bee reports 3 firefighters in critical condition with burns. Good coverage at San Diego Union Tribune. New voluntary evacuation for SD south of Main and east of I-805. This seems to be unbelievably bad. The winds were so bad that they were uprooting trees and downing power lines, which is not the conditions under which fires can be controlled. Links. Jim Klinge. News8, San Diego blog. And Still I Persist has updates and photos. Brokers Outpost. Broker burned out. Calfire Blog. CR at Calculated Risk says he's okay in OC but smoked up. Fire map here. There's an amazing expanse of CA exposed to fires and/or smoke emergencies. Sedgewick is Santa Barbara County. Ranch, Canyon and Buckweed are Los Angeles County. Santiago is in Orange County. There's another in Riverside, and a whole bunch in San Diego County. GeoMac is good for perimeter info, but at this point it is overwhelmed and out of date because most of the SoCal fires are moving so rapidly. Don't use it or any other "official" sources unless you really need the info, because many of them have succumbed to traffic overloads. Pray for them all. They are evacuating and in some cases re-evacuating. The official shelters are filling up, because over 250,000 people are under evacuation orders. It's extremely difficult for people who have animals, especially large animals like horses. In some cases the telephone lines have been downed from winds and falling trees, so the automated telephone notifications aren't working. I swore to myself that I'd get this done last week. Nothing like missing another deadline, eh? This is a graph of the Rockefeller Institute sales tax data. Right click on the graph above to get a larger version opened in another tab or window. If you don't do it, you won't really be able to follow the rest of the post. We don't have third quarter data yet, and won't for a couple of months. Rockefeller Institute sales tax data is very high quality. What you see graphed above are receipts adjusted for legislative changes compared to receipts adjusted for inflation. Note that motor fuel taxes are excluded. The inflation adjustment used is the implicit price deflator for state and local governments, not the CPI. What's important here is not just the positive/negative change, but also the difference between inflation adjusted (real) and the nominal change. Sales taxes are charged to end users, although details can vary from state to state about which business purchases have exemptions (purchases for resale are exempt). Also, some services in some states are subject to sales tax. Thus the sales tax numbers incorporate both consumer and business spending. The 2001 recession was really caused by a drop off in commercial spending, and you can see how quickly it moved. The reality is that whenever the difference between real and nominal sales tax receipts is quite positive over a year, there is a positive feedback loop into the economy. When they come close to equivalence averaged over a year, it generally presages either a significant downturn if the relationship has been positive, or the beginning of a significant economic growth pattern if the relationship has been negative. This is because when real receipts stop growing, corporate profits are constrained and job growth will be constrained, and when real receipts have been dropping but then stabilize, the spending growth pattern is beginning to shift to a positive feedback loop through the economy. You can see the last two recessions in this graph, as well as slowdown periods. You can also see the effect of Katrina in the last half of 2005. We really never managed to climb out of that effect, although no one expected that at the time. In addition, MEW has been so high that it has added a significant amount of spending power to the economy, so the small difference between real and nominal spending as measured by sales tax receipts is remarkable over the last two years, and in many ways it is due to weaker business spending. Naturally enough, the decline of construction and the credit problems are exerting a downward thrust of their own, and no matter how many economists say that income increases are providing impetus, it's obvious from these figures that income isn't providing much in the way of real spending growth. If you take the YoY change for these figures, the situation becomes even more obvious. See the graph on page 3 (pdf) of the Rockefeller Institute's last publication to understand how close to the zero line we are walking. YoY growth of 1.9% is only about 1% over population growth (estimated as .9%), which is far too little to even be certain that real spending is growing. In the third quarter, things got worse. Additional states are reporting sales tax nominal drops. Georgia and California rolled over, for example, and I believe Pennsylvania went YoY negative on some measures. There are quite a few more. This is not a good sign, because the second quarter was clearly very, very weak. It's a remarkable phenomenon that the construction weakness has not shown up in jobs nearly as much as in corporate and personal tax receipts. I would say that this is due to both declining margins and a largely unreported loss of jobs in construction. Most construction is subcontracted to firms that aren't picked up by the establishment survey, and much of the growth of construction employment was filled by illegal aliens who don't even have household phones and are certainly not going to discuss household information with some phone surveyor. Thus they don't show very much in the household survey either. A further downturn is more than the economy can bear, so I would say that the recession is here. I was willing to call it in the second quarter, because while nominal figures look much stronger than inflation-adjusted, the inflation itself seems to be causing a lot of the weakness. Retail is clearly having a very tight year, and job growth for retail has shown that weakness over the last eighteen months. I do believe that we rolled over into the arena of unrecoverable weakness in the second quarter. There are other factors that show what is happening in the economy. Demographics are little discussed, but inflation's impact upon older individuals, most of whom are living on relatively fixed incomes, just leaps out from the numbers if you look at state data (go to page 6 in the link!) combined with state demographics. Populations with larger cohorts of lower income or older individuals show significantly more weakness. The YoY relative growth patterns in the retail sales report show a marked shift in spending toward necessities and away from discretionary. Not all states impose sales taxes. Most of those who do exempt food from sales taxes. You can find a list of states which impose sales taxes on food here, and if you look at the second quarter sales tax receipts by state in Table 3 on page 5 of the Rockefeller publication, you see that, on average, these states showed stronger sales tax revenue than regional states which don't, especially when you adjust for legislative changes. So what are we looking at going forward? Well, the California sales and use tax figures pretty much tell the tale. September 2006 compared to September 2007 show a YoY decline from 2,090 mil to 1,929 mil in 2007. Unemployment in California is now up to 5.6%, and we are certainly seeing the effects of that. The effect on government employment will probably be one of the substantial factors going forward. Over the last year, government and public-financed employment has been a much larger contribution to employment growth than private in many areas. But state tax revenues are weakening substantially in too many states for government employment to continue carrying this load. In the last couple of weeks, we have seen gas prices decline slightly, but no one seems to think that can continue. If gas prices reach $2.90 on average by November, it's going to be very ugly. Diesel prices continue to rise, indicating that price inflation in stores will resume. The current economic downturn is quite different from the 2001 downturn (which really began in 2000). I call it "slow, creeping and consumer-led" because it is consumer spending which is the major cause. The credit crunch and the end of the housing boom would not cause a recession now if real consumer incomes had been keeping pace with inflation. But they haven't been, and for years now growth in consumer spending has been funded by debt. Since late 2005, the combination of relatively high consumer debt and high consumer inflation has pushed the real growth in the economy down to a narrow floor, and the contributing factors of the relative credit contraction and diminished construction spending and job growth are just undercutting the support from that low rate of growth. This whittling process will continue. It's very unclear at this point whether cutting Fed rates will do much to change the fundamentals of this economy over the short term. I believe the Fed knows this very well. One can talk about real income growth, but the reality is that higher benefit costs (often for lower benefits) are converting that real income growth into smaller or barely rising paychecks for upwards of 40 million employees, who then head off to the gas station and grocery store and face very real inflation. If cutting rates causes a cheaper dollar, fuel prices will continue to rise, which hits companies selling to the US consumer rather intensely. The Fed has a very limited scope of action. It can cut only if it has the margin to do so in comparison with other global economies. Money moves globally, and the Fed cannot stimulate growth in the US economy unless it preserves some ability of the US economy to attract investment. The combination of high consumer debt loads and high inflation is a very difficult one for any economy to overcome. For many US companies, high debt loads accumulated during times of cheap credit are now coinciding with lower profit margins, so it is highly doubtful that companies whose spending was contributing substantially to growth in the domestic economy will sustain their spending. An example of this are changing plans for retail and restaurant chain expansion. Duration of this high consumer inflation is also a factor. For the first year or so, many consumers considered it temporary and were willing to keep spending by using credit in one form or another. There are growing indications that this attitude has changed significantly over the course of 2007. There is no question that many of the refinancings which traded higher rates for lower payments and higher principal balances were done to pay off other consumer credit. This presages further problems with auto and credit card loans, making it likely that credit standards will tighten incrementally over 2008. I mentioned my worries over ship lines earlier, and MC, whose commentary I value, said that they were chock up at shipyards. But over the summer, I have seen consistent indicators of pre-selling lines (very experienced owners selling out), and some of these interests were being sold at very substantial devaluations from prior sales. Normally that would occur 12-18 months before it hit generally, just as for example, a couple of big investors in retail commercial in the US unloaded in 2005/ early 2006. The Bloomberg Tanker Index has risen 19 percent in the past two years, even as freight rates sank 38 percent. The price of marine fuel, the biggest cost for shipowners, has advanced 73 percent to a peak of $446.50 a metric ton and the number of ships available is near a record. Falling freight rates and record fuel costs have given shipowners their longest string of losses in five years, according to Citigroup Inc., the third-largest lender to the shipping industry. So-called very large crude carriers, which transport about 2 million barrels, are losing more than $13,000 a day in the market for day-to-day charters. Shipowners are spending more on fuel and debt payments than they collect in rent. Suezmax vessels, the biggest tankers that can navigate Egypt's Suez canal while full, are losing more than $10,000 a day. Owners of aframaxes, 600,000-barrel carriers that usually haul crude within the same continent, are losing about $13,000 a day, Citigroup estimates. There's a lot of important stuff in here. Jay update: He left the hospital Wednesday and did not collapse. He's still very weak, but is making progress. He sent this message to everyone "Laugh loudly, and share your Lord's passions as he's shared them with you." John Mauldin posted a newsletter about the great SIV caper. I think it's pretty good, and it is definitely understandable. There's a decent AAR on Bloomberg for the week. The note of surpise is sort of funny. The S&P 500 fell 3.9 percent this week and the Dow average lost 4.1 percent. The Nasdaq declined 2.9 percent. All 10 industry groups in the S&P 500 decreased today, with 481 of the index's members posting declines. Energy shares posted the steepest decline after crude oil retreated from a record. More than 17 stocks dropped for every one that gained on the New York Stock Exchange. A gauge of stock-market volatility rose the most since March 13. Apparently some investors were buying the subprime containment story. That's the only possible explanation of why lower profits across a wide range of companies should have come as a surprise. It's the surprise that's unnerving me, because it indicates that there is a lot of adjustment to come. This is the weekend that Fannie rolls out the next version of DU. EA II and EA III are limited to LTVs of 97 and 95%, respectively. Beginning December 1st, all EA's will receive another LLP surcharge of .5%, but LLPs added this summer related to risk will remain in effect. Another change is to the qualifying rate for short-term adjustables (defined as three years or less). This change mandates that qualifying be done on the basis of the fully indexed rate rather than any introductory rate. The announcements are at this page. Fannie had suspended Condo Acceptances, and on Friday it issued a Lender Letter saying that the new procedures will be published by November 15th. Without Fannie, no one's financing condo projects. Fannie is expanding its universe somewhat though. In this version of DU, Fannie will use the higher of either the 2006 or 2007 Area Median Income to determine eligibility for its MyCommunity program. It is also retaining the conforming loan limit of $417,000 for a THIRD YEAR. Last year it announced that it wouldn't drop it for 2007, but would adjust for 2008. This year that was quietly finessed. In fairness to Fannie, it has been offering some remarkably flexible mortgages in recent years. IO, hybrids, 100%, etc. If those mortgages are refied, cutting eligibility could put some of those borrowers in a very diffiicult position. If those mortgages aren't refied, there's a much worse situation. The problem with writing IOs which reset to a fully amortized payment for the remaining term is that the amortized payment will be considerably higher than a 30 year traditional, causing wicked payment shock. When you combine that with an ARM feature which involves an adjustment to a higher interest rate, the effect is magnified. Therefore, Fannie is pretty much forced to these strategies due to the loans it was writing earlier in the cycle, or it will be tipping its own borrowers into default. Believe me, Countrywide did not invent risk-layered Alt-A. Fannie will probably not reduce the conforming loan limit for several more years, even if regs have to be rewritten every year to allow it to keep the higher amount. Still, the most significant limitation (other than pricing) this year was Fannie's July instruction about declining market appraisals, which mandated reviewing list prices in declining markets. A lot is left to the lender's discretion, but the upshot is that lenders can get sanctioned for a pattern and practice of ignoring these guidelines if the result is losses. And believe me, losses there will be. Housing Tracker will give you an insight on declining list prices. Salt Lake City's 6 month drop of over 12% deserves star billing currently. Six month comps are quite out of date in some of these markets. Orange County is battling for supremacy, though. The six month drop is only 7.8%, that is true. But Orange County has actually been declining for quite a while, and it may well eventually challenge Miami and Cape Coral for the all-star slump sweepstakes. Orange County has staying power in this race. In the state races, Florida has already won. California and New Jersey will battle it out for some years to come for a close second. At this point, my money is on New Jersey. It's a little state with a chip on its shoulder and a competitive yen for spectacular suicide that has managed to line up a winning coalition of bad demographics, bad state government and bad local government supported by a population that is either delusional or desperate to escape. In the end, the fundamentals always win. Other than NJ, no state offers its luckless middle-class inhabitants such an array of high property taxes, high general taxes, anti-business elitist thinking, towering public debt, and sheer idiotic, institutionalized corruption. The next time New Jersey holds a competition for state motto, the winner will be "New Jersey, the next Michigan" or perhaps "New Jersey and you, going bankrupt together". MetroPCS Communications Inc., a Dallas wireless-phone-service provider, is suing Merrill Lynch, charging that Merrill brokers invested $133.9 million of its cash in 10 auction-rate securities, which are considered low-risk investments and commonly used by companies to manage spare cash. Nine of them were issued by collateralized debt obligations, which were underwritten by Merrill and were backed by pools of mortgage and other assets. The lawsuit, filed yesterday in Dallas state court, charged Merrill with fraud, negligence and breach of fiduciary duty in making the risky investments in violation of the client's stated goal of holding low-risk, highly liquid assets. Bill Brewer, the lawyer who represents MetroPCS in the case, said his client would like to find out whether Merrill Lynch underwrote the securities that were sold by the Merrill brokers, and whether the sales were made out of Merrill's own inventory. I'm waiting anxiously for Compucredit's report on November 5th. They cater to the low end of the CC business. Retailers started noticing the strain in late spring and early summer as they were monitoring the spending around the paycheck cycle. Wal-Mart and Family Dollar key on the first week of the month, when government checks like Social Security and public assistance generally hit consumers' mailboxes. 7-Eleven, whose customers are more diverse, looks at paycheck cycles in specific markets dominated by a major employer, such as General Motors in Detroit, to discern trends in shopping. To economize, shoppers are going for less expensive food. "They're buying more peanut butter and pasta. And they're going for hamburger meat," Flickinger, the retail consultant, said. "They're trying to outsmart the store by looking for deep discounts at the end of the month." He said the last time he saw this was 2000-2001, when the dot-com bubble burst and the economy went into a recession after massive layoffs. Food banks are reporting significantly higher demand around the country. Interestingly, contributions to food banks from grocery stores are also dropping at some sites I have sampled. It appears that grocery stores are retaining and discounting some of the items they used to donate. As the article notes, wages may be reported higher but the distribution of those increases is skewed to the top end of the earners. Because of higher insurance costs, quite a few of the lower end earners are actually getting less in nominal terms this year than compared to last year. The company said several key U.S. industries it serves, including trucking and nonmetal mining, are "in recession," and its machinery sales to nonresidential builders are declining as fast as sales to the residential building industry, which it said was in "severe recession." Caterpillar said a number of factors weighed on third-quarter results, including higher manufacturing and material costs, which increased core operating costs by $294 million. It said the tightening of the credit markets in recent months has not had a significant impact on its own borrowings. But it said loan delinquencies of more than 30 days at its Cat Financial unit, which finances equipment purchases by the company's customers, jumped to 2.52 percent at September 30 from 1.89 percent a year earlier. "Most of this increase is related to North America and is specifically related to the downturn in the housing market," Caterpillar said. As for profit, 19% of the increase derived from currency fluctuations. Caterpillar's forecasts are based on the idea that GDP in 2008 will grow 1.5%. YOU know a market has seen better days when some of its leading actors are compared to a deadly virus. An excellent, excellent post by Tanta at Calculated Risk, but first skim this one. These posts are about FHA downpayment assistance programs. Please keep in mind that delinquency rates on FHA mortgages crossed the 12% line this summer, and studies have proven that down-payment assistance programs from certain types of organizations are strongly correlated to defaults. The Street will be relieved today over news that initial unemployment claims popped up 28,000 to 337,000. Things were going south pretty rapidly yesterday until the Beige Book was released, and the tepid rhetoric there gave the Street hope for another rate cut. This initial claims report will boost that hope. Thus, for the good of the Street and leaky SIVs, the masses must start reporting to the unemployment office. "Retirees are going to feel a disconnect this year between the COLA increase and the reality of the inflation they face," said Mark Zandi, chief economist at Moody's Economy.com. "If this calculation were done in another three months, it would be measurably higher." Advocates for the elderly said the small increase highlighted the need to revamp the cost-of-living adjustment to better reflect prices paid by retired people, including the money they spend on health care. The Senior Citizens League said a study it has done showed that in eight spending areas, people over age 65 have lost 40 percent of their purchasing power since 2000. This finding reflects factors such as big increases for gasoline, home heating oil and prescription drugs. My own figures show about 36%, but their figures could be more accurate. It is an unpleasant fact of life that many older people were forced to remortgage their homes in order to keep paying the taxes on them plus eating, and unfortunately quite a few of them got toxic loans. Retirees are also going to be paying higher Medicare premiums, and the new income-adjusted premiums are phasing in over the next few years which will ding the wealthier recipients substantially. It is true that inflation has been hitting lower income persons, whether retired or not, far harder than CPI displays. We're in a global pattern of regressive inflation in which discretionary purchase costs keep dropping, but basic needs costs are rising quite rapidly. Eventually this inflation will break loose in the domestic economy, because the domestic economy needs the truck drivers, health aides, grocery store employees and the like. You can only hold their wages down so far until they depart from areas in which they cannot make a go of it. Actual Street news continues quite bad. The outlier was poor Thornburg Mortgage, which lost $8.83 a share. E-Trade moved its lovely AB securities to a for sale account and wrote them down about 50%. The regional banks are reporting disappointing results, and treasury yields dropped yesterday, reversing their Super SIV trajectory, plus reflecting the rising expectations of another rate cut. In the third quarter, profit at the corporate and investment-banking division plummeted 93 percent to $100 million from $1.43 billion a year earlier. The unit marked down the value of financing for LBOs and other lending by $247 million. Analysts at Citigroup had predicted a writedown of as much as $700 million. The bank also reported a $607 million trading revenue loss on credit products, and a $527 million loss in its structured products unit, which includes mortgage-backed securities. Earnings at Bank of America's consumer and small-business banking unit fell 16 percent to $2.45 billion. Interest income rose 1 percent as the year-over-year decline in long-term rates and a move of customer deposits into higher- yielding accounts made lending less profitable. Regional banks such as WaMu are reporting sorrow and general grimness as well. In general, most companies selling to consumers are reporting a tighter profit environment. IMF joined the joy yesterday by cutting GDP projections for various regions and countries throughout the day. It will be difficult for the bulls to haul this week out of the trash bin. Update: the major mortgage insurance companies are in, and grim is the word. This will punch more holes in the MBS sieves. When you start reporting losses, buying back shares is not an option to make things look better. To set the tone, a rather good WaPo article on the Great SIV Caper. Remember everyone talking about "panic" and "hysteria" back in August? The assets were fine, we were told by the financial cowboys. It's just that a surge of irrationality has hit the investor herd (somebody flapped an umbrella or something), and when they all calm down everything will be fine again. Cheyne Finance Plc, the structured investment vehicle managed by hedge fund Cheyne Capital Management Ltd., may not be able to pay its debts, receiver Deloitte & Touche LLP said today. The receiver declared an ``insolvency event,'' it said today in an e-mailed statement. Next up, Shiva makes an appearance in SIV form. This is not the third event, but it moves us closer to the brink. There's a surge of commercial construction loan defaults beginning, and it is going to be very hard to get savvy investors back in the ABCP corral without guarantees of performance. Super SIV ain't gonna do it. Industrial Production came out yesterday. It was up .1 in September compared to August's downwardly revised 0. Still, the numbers were better than that would indicate, because August would have been sharply negative if it hadn't been for a heatwave which pushed utilities up 4.6%. So this was a real improvement, although the last two months are disappointingly flat compared to the prior two months' figures of .5 and .6. Also see this Markian news nugget, and his two oil per capita posts. The market is going to get a kick in the rear from the housing starts and permits for September. Permits were down 7.3% from August and 25.9% from last year. Starts (a more immediate employment/spending indicator) were down 10.2% from August and 30.8% from last year. I want to stress that the first few months on this report come very substantially from imputed data, and that I don't regard the month to month statistics as worth much until four months have passed. But I will concede that these numbers are so high that they accurately indicate at least the trend. On an even more sobering note, completions were down 11.6% from August and 31.1% from last year. As what's in the pipeline fades, the construction industry will get hit again. It's too soon to tell how single-family is really doing. Most of the building companies are going to continue to build out land for cash flow, because in most cases they can't sell the land. They will probably do these until there are bankruptcies and consolidations in the industry sufficient to cut capacity to conform to demand. In other words, look for a recovery in this industry after a large consolidation, and not before. Perhaps 2010, 2011. Calculated Risk should put up one of his comprehensive, graph-rich posts on the subject today. Consumer Price Index, which you must take with a grain of salt, is out. The headline number is .3 for September.The 9 month is 3.6%, which would be the highest for years and years. Please look at the correlation between energy and the headline numbers by year. Note that we have more structural inflation apparently off lower energy costs. That is largely because of food inflation related to the ethanol adventure of a politically correct but economically illiterate Congress. The strategy of a weakened dollar accelerating US manufacturing will only work well if we can boost internal energy production, especially electricity. The renaissance of the 80's was really due to a massive shift in energy consumption and production which boosted our oil production greatly. Until we correct our energy imbalances, the domestic economy will continue to suffer and consumers will take the brunt of it. Basically, we are being politically correct at the expense of the lower 40% of our society. A more regressive, vicious set of policies can not be imagined. We urgently need to expand domestic production of all sources of energy, but oil, coal and nuclear power are the most important. Manufacturing is energy-intensive, and unless you have currency internal production to meet the demand rise in manufacturing, you don't really get much of the benefit from the weakened currency. Oh, Lord, I'm laughing so hard I feel ill. Despite all those $200 sneakers you hear about and the long lines at Starbucks, consumers are actually spending less of their income — much less — on discretionary items like clothing, entertainment and food than their parents did. In fact, after taking care of essentials like housing and health care, today’s middle class has about half as much spending money as their parents did in the early 1970s, Warren says. Ya get that? Food is discretionary. Housing and health care is essential. Back in the way back then yonder, people knew that if you didn't eat you would get sick and even die. Maybe we've forgotten that, which would explain why we now think health care is essential but don't worry about people not having enough money to buy food. Also it would explain the calculus of the mortgage moguls, who apparently thought people would go to work naked and stop eating rather than stop paying their mortgages. Or at least that was what they seem to have been counting on considering the Debt To Income ratios they feel are viable. I want to believe that this article is just a case of truly terrible journalists misquoting a professor but I can't really make a good case for that. Nothing is included for food in the little table of fixed costs sourced from the esteemed Warren of Harvard. I guess at Harvard, modern humans are like Spanish moss - they just inhale and grow. Toward the middle of the article the reporting staff seems to be making the opposite case and doing a very good job of it if you look at the statistics offered, which do not match the rhetoric well. I'm guessing that Harvard really has no clue that humans need to eat. If this is what Harvard's talking about, it does explain why the presidential candidates all sound as if they've just been beamed down from the mother ship and are still a bit disoriented. Every campaign they stop by the Ivy League to get their talking points, because they know journalists are snobs and only talk to Ivy League professors when writing puff articles. If there's ever a terrible flea outbreak at Harvard, you can bet your bottom dollar that we will get free insect treatment campaigns rushed through Congress after it has become the issue in a campaign cycle. Heck, even Greenspan mentioned that maybe gas and food are important components of consumer inflation. People - even real life people - are asking me about the Super SIV conduit set up by JPM Chase, Citibank and Bank of America. I wanted to refrain from commenting because I had nothing good to say about it, and I didn't want to have any part in the ranting that's going on or contribute to what was likely to be a very bad week on the Street. But since they are holding the equity value burning party without me (what's happening is that most consumer-related businesses are coming up with lower profits, lower profit warnings or other weaknesses, and this is giving the Street the willies, especially since some of these companies are refusing to promise to buy back their shares to compensate), I guess I'll express my opinion. First, most of what was written about this being a liquidity restoring maneuver is BS. It could have served that purpose, but it would have needed broader support to accomplish that goal. I believe Nomura's exit from the US scene (they are even closing down their Treasury ops) yesterday indicated that it has utterly failed. Nor is Deutsche Bank in the deal so far as we know, even though DB did get a Reg W exemption of its own. It seems that the foreign banks may have concluded that the Fed will support US banks first and that they are likely to end up with the raw end of the deal. This has major ramifications for the year to come. So what is the real motivation? The three banks involved are the largest US banks that got Reg W exemptions, and they will use this to offload some of their excess lending to affiliates. This new vehicle won't improve the quality of the assets, but it will allow movement of obligations from affiliates to this new vehicle, provided that the new vehicle is structured correctly. You can bet that part of the negotiations involved getting a ruling from the Fed on how this would have to be structured to allow exclusion from the Reg W limitations. Why do I believe this deal won't improve liquidity for the market in general? Because a big chunk of the market value of these funky loan instruments used for Asset Backed Commercial Paper (ABCP) ended up being not their expected return, but their capacity to be used for financial gearing to exploit the spread between short term rates and long term rates. In other words, if I take a bunch of these no-doc Alt-As, or auto loans made at an average rate of 4.5% and hold them for their lifetime return, their value is X. Using financial gearing, which is the real function of ABCP, those same loans have an expected return of X + Y. It is true that Y is less than X, but it's still a substantial addition to value. When entity A makes a loan, it sells it to another entity. The loans are grouped and packaged into asset pools which are then often securitized in some form or another. Components of these securities may then be pooled and securitized again. Sooner or later, some chunk of this financial gunk is used to provide security for short term loans. So the entity holding the paper is supposedly getting payment at long term rates minus all the fees that are involved, and it recovers its money by making short term loans that constantly roll but that carry much lower rates. The key is to recovering the money so it can be circulated back and earn money for the intermediate whatever. If, in theory, my package of financial gunk is paying me an average rate of 5.5%, and I am recovering the vast majority of my principal by lending at rates of say 3%, I have a good thing going. I get the spread, and I get the principal back, which I can use for other money making purposes. Out of my returns I pay fees to someone to guarantee or facilitate the whole gearing operation, so I don't get all the spread. The value of Y is the spread minus my fees that I pay to the facilators plus any needed guarantors. When the Fed cut short term rates so low after 9/11, these big outfits made a ton of money by profiting from the spread between short term rates and long term rates. It was like dumping fuel on financial engineers, who threw it into the maws of the financial engines, which accelerated the financial profit engines and sent them careening down the tracks into a bright financial future which generated absolutely superb year end bonuses. Then the Fed started raising short rates, but the dauntless financial engineers kept the party going by using ABCP to restore the effective spread. You can do many things when you keep your eyes firmly fixed on your year end bonus package. (See the two graphs at the bottom and note the correlation between the rise of ABCP and the rise of short rates.) This was all completely wonderful for a while. The wonderfulness was such that the financial engineers experienced an insatiable appetite for these loans which could be used to manufacture financial gunk. In fact, the future was so bright that everyone had to don shades to protect themselves against the glare generated by those scintillating bonuses, so no one noticed for quite a while when the underlying asset quality of the financial gunk started to deteroriate. Those were just meaningless shadows flashing by as everyone hurtled down the track toward the Hall of Year End Riches. Eventually, the components of the financial gunk got so bad that they started imploding while they were still in the pipelines, and the blinding light of those explosions pierced the hopeful dimness of the shades. Guess who guaranteed these deals, either explicitly or implicitly? Guess who is facing having to come up with the cash? Guess who was getting the fees? Needless to say, this is all dependent upon the people who are willing to make short term loans to me at low rates backed by my financial gunk plus any guarantees. When that willingness fades, abruptly the value of Y disappears and my financial gunk's market value is once again only X. From the first graph, we can see that close to 300 billion of the asset backed has not been renewed, and so someone is sitting on an abrupt and real decline of value for the underlying financial gunk. It is true that the underlying financial gunk was greasing the wheels of commerce for a while, but it become all gummy and is impairing the ability of the wheels of commerce to keep rolling down the financial tracks. And now the financial engines are smokin' due to the extra strain imposed by pushing these gunked-up wheels further down the tracks. The three banks will somehow be backing the 80 - 100 billion that winds up in the M-LEC vehicle, so they are going to take a real loss. If anything, this is going to confirm to the general market that the losses involved in the crummier financial junk is real. The exemptions given to these banks were 25 billion each, so we can see how the size of the pool was decided! The only benefit I can see is that the banks involved will be able to return to compliance under Reg W. They were forced to offer up over collateralization for the purpose, so as the market value of the gunk components drops they would have to keep throwing more and more into the collateral pool. Thus offloading does allow them to ungunk the wheels a bit. The opening round in the current quarrel was when Citi said it had no plans to expand share buybacks. That caused an early drop. But then the earnings release, which is considerably more problematic than the headline numbers. Global consumer revenues increased 14%, driven by international consumer up 35%, which included a $729 million pre-tax gain on the sale of Redecard shares. Excluding the gain, international consumer revenues increased 21%, reflecting deposit and loan growth of 18% and 29%, respectively, and higher investment sales, up 26%. In international consumer, higher credit costs reflected an increase in net credit losses of $460 million and a net charge of $717 million to increase loan loss reserves. The $717 million net charge compares to a net charge of $101 million in the prior-year period. The increase in credit costs primarily reflected the impact of recent acquisitions, portfolio growth, and a change in estimate of loan losses. There seem to be more structural problems here than just the credit "turmoil". That did cost them a pretty penny, but that's recoverable. Unless I'm dreaming, they increased loan growth by 29% and increased their loan loss reserves by > 700%? Someone, slap me and wake me up! I guess one couldn't argue that it was unjustified, given their credit losses for the period. Nonetheless, the pattern here is rather disturbing. Are those EazyPay loans in Indonesia paying back? Is it "a peso down and a peso when you catch me" in Mexico? Excluding the Redecard sale, net income on international cards declined 38%, although net revenues grew 40%. International consumer finance was disappointing, and there is a special note about Japan. (See more on Japan here.) International retail banking net income declined 21%, but US retail distribution income declined 47%. I knew it would be bad, but this is a really distasteful earnings report which should cause everyone to sit down and think a little more about the decoupling theory.